We started early today. Plotted a course to the Trifid sector, 16 jumps, and headed out with a mixture of excitement and anticipation. What did the day have in store for us? what secrets would the galaxy reveal? 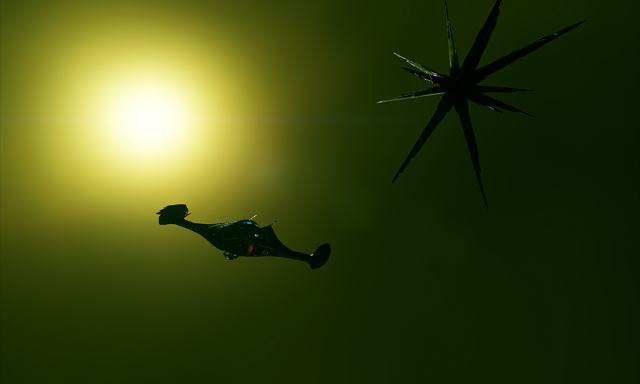 After about 5 jumps we started to hit undiscovered systems, nothing out of the ordinary, but good to know we were finally getting into less charted space. we were still encountering pre-discovered systems as we crossed the tracks of previous explorers, but the gaps between them were getting more pronounced, and most of the discovered systems had not been mapped, suggesting no-one had been through since the recent scanner upgrades. Trifid Sector DL-Y d157 looked like a normal run-of-the-mill system on Galmap, a friendly scoopable F class star and the probability of a selection of planets, with a bit of luck some might be terraformable. We dropped in out of hyperspace, turned away from the star and ran up the usual scanning routines. Bingo, a blip at the ELW frequency on the FSS scanner. Cathy proceed to start scanning the whole system to collect the planet data, but my eye was caught by an unexpected blip at the other end of the scanner range, well below the star and asteroid cluster frequencies. Cathy spotted it too, and deftly adjusted the scanner to zero in on the frequency and tracked down it's location in the HUD - Notable Stellar Phenomena! A buzz of excitement leapt through me, this is why we were out here. Then I noticed that the blip was still on the scanner radar. Was there a second phenomena? In fact, there was not one, not two, but three Stellar Phenomena in this system, an explorer's motherlode! Suddenly an ELW seemed very mundane! Making sure the shields were powered up and at full strength, we set a course for the nearest phenomena with nervous excitement and with no clue as to what we would find when we got there. At 1Mm the Frameshift Drive disengage triggered and we dropped to normal space. We were greeted by a bright green cloud of matter, several Macrometres across, sitting directly in front of us. I moved us slowly forward until we were in scanner range and Star Reaper's computers analysed, and reported that it was a Lagrange cloud. I'd heard rumours of these, but never seen one before. I don't understand the science but I've heard that they're a gathering of dust and matter at a point where the gravity of two bodies creates a stable patch in space. Whatever the science, this was a awe-inspiring and unexpected sight, but more was to come. As we moved closer, the ship's radar began to pick up faint signals from within the cloud. We cautiously eased into the cloud, and then could visually pick out shapes of 'things' in the distance. 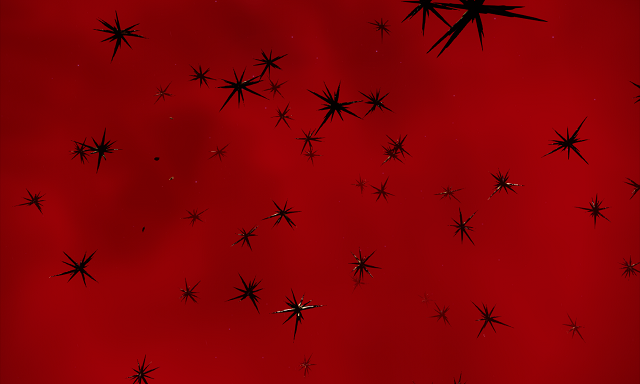 These slowly resolved into star-like shapes. 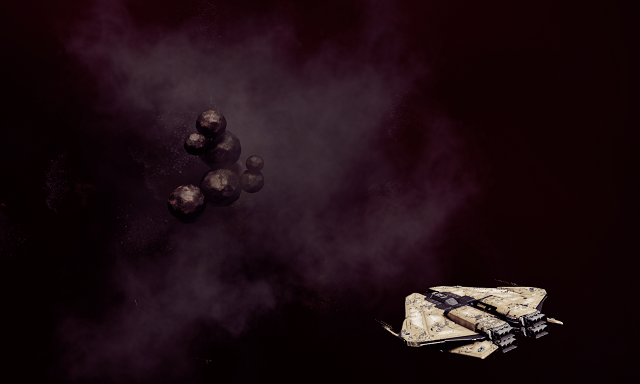 At this point, not knowing what these were, and not wanting to risk Star Reaper, I brought us to a halt and decided it was time to test the new Imperial fighter. Launching in the fighter, I ordered Cathy to keep star Reaper at a safe distance, and moved closer to one of the objects. It seemed inert, so I closed to scanner range and fired the Composition Scanner, ready to high-tail it out of there if the object reacted in any way. The scanner readout showed it to be a Prasinum Metallic Crystal - a crystalline structure created by huge numbers of primordial microorganisms. But they were huge, much bigger than my fighter! I scanned several more and found there were two types Prasinum and Purpureum, both were inert and didn't react in any way to my fighter or scanning. At this point I was getting the feel for the GU-97 and so went for a bit of a scout around the area. There were loads of these crystal structures, all just hanging inertly in space. What were they for? What do they do? It all felt quite spooky in the green-tinged light of the cloud. Suddenly, my peripheral vision was caught by a different shape in the haze. This wasn't a crystal structure. Radioing Cathy to keep Star Reaper clear till I had checked things out, I headed towards the new object. This was different, much more organic looking than the crystals. Another cautious approach and scan reported that this was a Rubicundum Collared Pod - an organism that absorbed energy through it's distinctive collar. 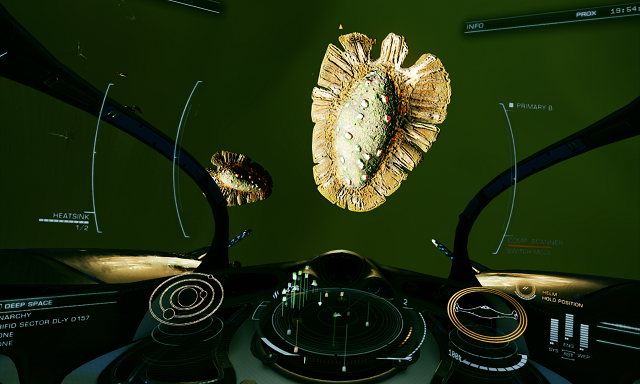 Again, it appeared inert and unresponsive to my ship or scanning. There looked to be several swarms/flocks/herds (?) of these pods hanging in amongst the crystal structures. Redocking with Star Reaper, we flew the big ship closer so Cathy could get her own close-up view of these phenomena. They were big, even compared to Star Reaper. Having done all the science we could at this location, we headed back to SC to check out the remaining two phenomena. Would they be the same? Phenomena two was another Lagrange cloud, but this time with a purple hue, and containing Prasinum Metallic Crystals and a new variation, Flavum Metallic Crystals. No Collared Pods in this one, but a new discovery instead, which scanning reported as Solid Mineral Spheres - mineral structures created by large colonies of ancient microorganisms. These sphere structures seemed to hang within thicker patches of dust and matter within the cloud. Again, these seemed to be inert. Phenomena three was maybe the most visually stunning, another Lagrange cloud, but red, with a large forest (?) of crystal structures, Prasinum and Purpureum, and a new species of Collared Pod - Albidum. After all this excitement, it was time to settle down for the night. Remember that mundane ELW? That seemed like a good reality reference, so we're parked in low orbit, discussing today's discoveries and trying make sense of what it all means, and how little we actually know about the galaxy. A day to remember. What will tomorrow bring?